I played the trombone in my high school band. Each year was an audition process to make the Region, Area, and ultimately the Texas State concert band or Texas State orchestra. So each year in August I’d get the audition music and begin practicing. By the time auditions came around in November I was as prepared. I had some natural musical talent that helped me excel and without a significant amount of effort in my Sophomore year I made the Region and Area band. But I did not make the Texas State Band. My junior year I worked harder, but again did not make it to the state level. My senior year, I hired a private instructor. And in August we set out a game plan. We mapped out when each practice was going to be held. We mapped out how far on each piece of music I would get to by which dates. We created a roadmap for what those next few months would look like. And in my senior year when it came time for auditions I was 100% ready. I felt confident. My audition was the absolute best it could have been. It was my absolute best effort. That year they took 16 trombone players in the State band or orchestra. I was number 17. While I didn’t ultimately reach my goal, I was so much closer than I had ever been simply because I had taken a 30,000 foot overview before I even started. I created a roadmap about the things I wanted to execute and that got me incredibly close to my goal. That’s what the beginning of each month provides for my financial goals now. It’s an opportunity to create a roadmap of what I want the next 30 days of my life to look like. If you want to create something similar, here are 3 tips for an awesome financial month. Write out everything that you have committed to attend for the next 30 days. Discuss your schedule with your spouse. Don’t forget about kid events or business trips or date night. Be detailed and look at each of the next 30 days. Create a roadmap with your schedule. Our family uses shared Google Calendars for this because it helps keep us all on the same page. Budgeting sometimes gets a bad reputation. It’s sold to us as something that is hard, or worse something that is restricting. The truth is, budgeting is just a roadmap for your money. Without one you don’t really have a plan to follow. With one, you’re much more likely to hit your goals. So make your budget simple. Write down all of your income for the next 30 days. Then write out what you think your expenses will be for the next month. Start with your Groceries, Utilities, Transportation, and Shelter (GUTS). Then write out your health and insurance related expenses like doctor co-pays, gym memberships, and life insurance premiums. Lastly write out everything else you may spend money on like kids school pictures, or new jeans, or daycare, or going out to the movies. If you’re not sure what expenses may come up, create a Miscellaneous category and plan to have those unplanned expenses. Subtract all of those expenses from your income until the resulting number equals $0. 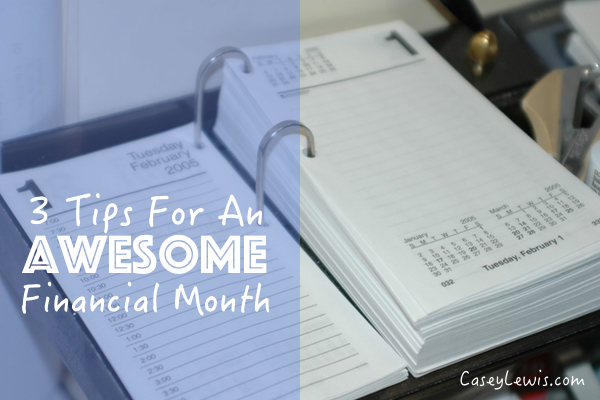 You don’t have to do all of these things to have an awesome financial month. You could luck into success. And doing all of these things certainly doesn’t guarantee success. But I promise if you take about an hour of your life at the beginning of the month to create a roadmap, you’re going to be much closer to your financial goals 30 days from now.